I baked these babies the other night and I noticed something magical happens when their sweet aroma wafts from the oven… kids seem to appear out of nowhere, and grown-ups, too! My family couldn’t wait to dive into their own stack of cookies and a tall glass of ice cold milk. 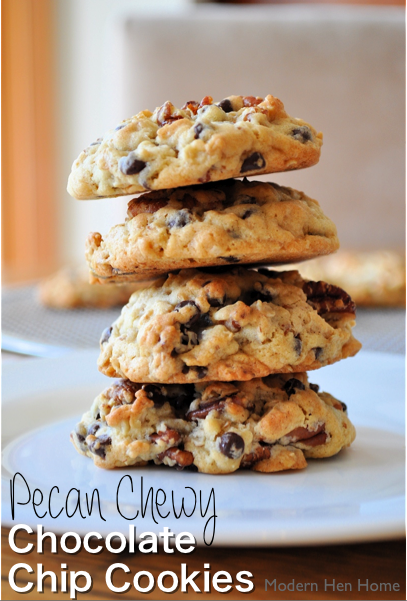 Packed with chocolate chips and pecans, they are soft and chewy with a nice, nutty crunch. Neither too thin, or too cakey, and very moist. 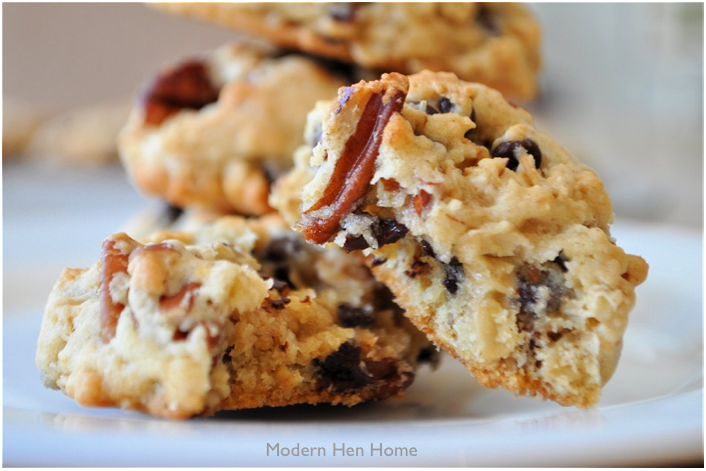 Rolled oats give them extra texture and a slightly “healthier” edge to regular chocolate chip cookies. Be sure to allow them their own space on the cookie sheet as they spread while they bake. And try one while they’re still warm for extra gooeyness. Walnuts work just as well in this recipe if you prefer them. Either way, they are super delicious and I think one of the best chocolate chip cookies you will ever have. Enjoy! 1. In medium mixing bowl combine oats, flour, baking powder, baking soda and salt. Set aside. 2. In large mixing bowl beat butter with electric mixer for 30 seconds until smooth. Add white sugar and brown sugar and mix on medium speed, scraping sides of bowl to mix well. Add eggs and vanilla and continue beating until combined. Then add 1/3 of flour mixture at a time, to combine well, until all the flour has been added. Batter will become thick and you may need to finish mixing with wooden spoon. Stir in chocolate chips and nuts and combine well with wooden spoon. 3. With a small ice cream scooper, drop dough (about 3 TBSP) onto parchment lined cookie sheets about 3 inches apart. Bake at 375* for 9-10 minutes, or until edges are light brown. Slightly cool for 3 to 5 minutes, then transfer to wire rack. Makes about 20-25 cookies. 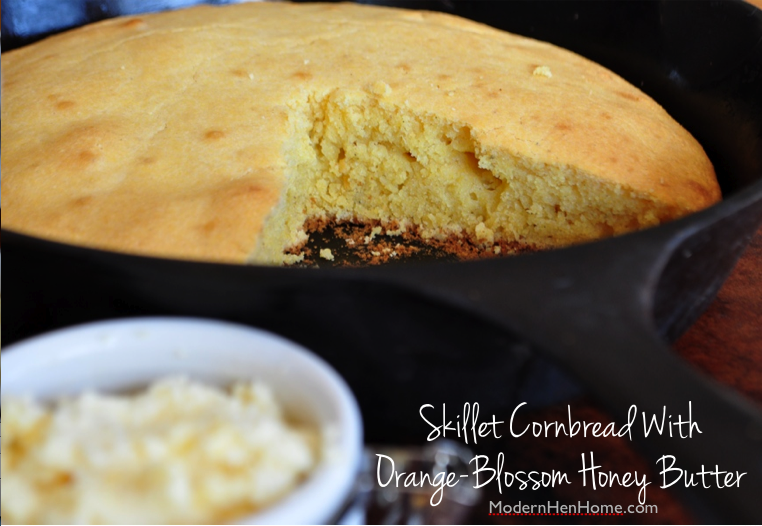 When I was growing up she baked buttermilk cornbread at least once, sometimes twice a week. Southern-style of course — with bacon grease or lard — the way she had been taught by her mother when she lived at home in Kentucky. 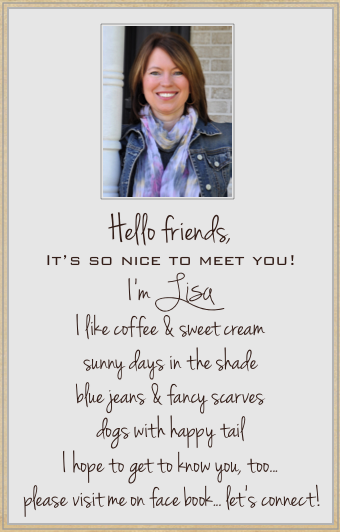 Walking through her front door I could smell the aroma of something special simmering on the stove… usually bean soup, fried chicken and fresh-baked cornbread in a black cast-iron skillet. She enjoyed cooking for her big family and would often call to say she had one of my favorite meals ready and hoped I would stop by. Of course I did, and often… along with many in the family. This is my kind of meal — chunky roasted vegetables basted in olive oil and lemon juice then sprinkled with kosher salt — magnificent flavors all by themselves and delicious served with a side of creamy hummus or your favorite cooked grains or pasta. Personally, I can’t resist a huge dollop of Greek Tzatziki Cucumber Sauce on my helping. Last night I served them next to these amazing >> Turkey Burgers. Of course, you can mix the vegetables anyway you like, and they are also good with fresh chopped mint tossed in. Pre-heat oven to 450*. 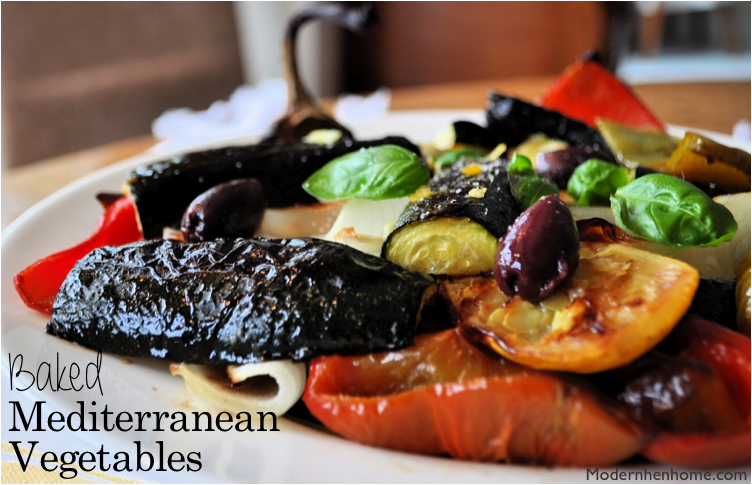 Place onions, zucchini, eggplant slices onto a baking sheet and brush with olive oil, and lemon juice. Turn each in the pan and repeat with oil and lemon juice, sprinkle with salt. Add peppers (no oil needed) to the mix and bake all the vegetables for 20 minutes, turning them once after 10 minutes. 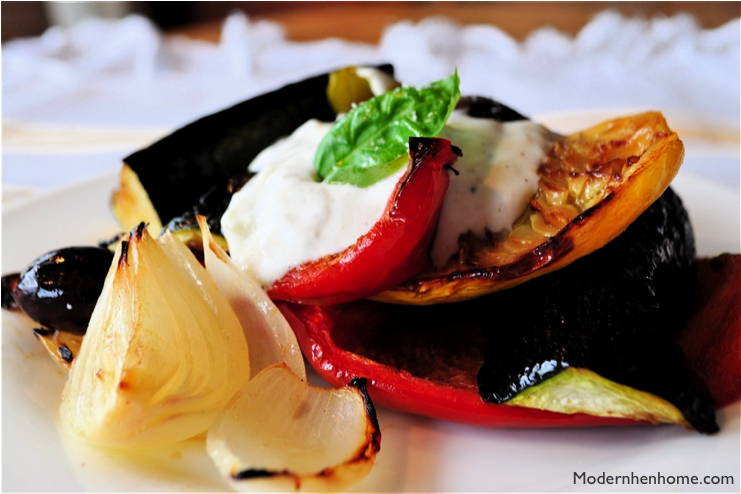 Vegetables are done when they are tender in the middle and browned around edges. Remove from oven and add olives, fresh basil and black pepper. Squeeze any extra lemon juice over the top. Serve alone or with hummus, Tzatziki, or your favorite grain dish or entree. So, this is how we have been eating around here this week. Really enjoying the vegetable harvest from our local farmer’s stand and also these last few weeks of summer before the kids head back to school. How about you? How have you been enjoying this season’s fresh vegetables? Do you have a favorite way to cook them, or do you prefer your veggies raw? I have wanted a chalkboard in my kitchen for a long time and never got around to making one until this past week. 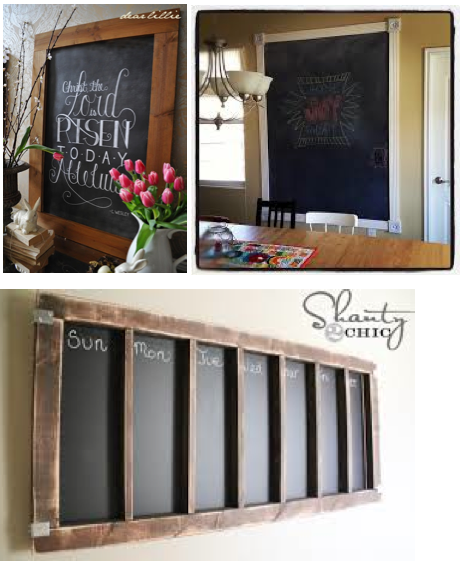 Pinterest has great inspiration ideas for crafts and these chalkboards are just a few of the neat designs I found there. 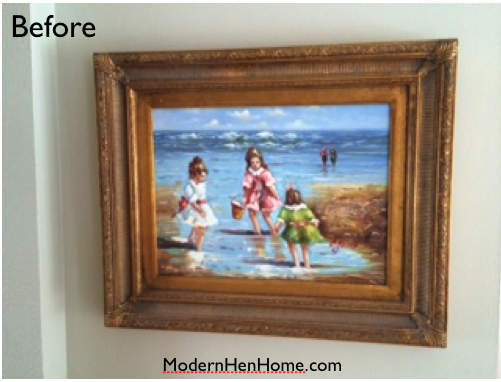 This decade old seashore canvas has been sitting in the back of a closet for a few months and I really like the frame, so I decided to use it and make the chalkboard. The original plan was to buy a piece of wood and cut it to fit then cover it with paint. 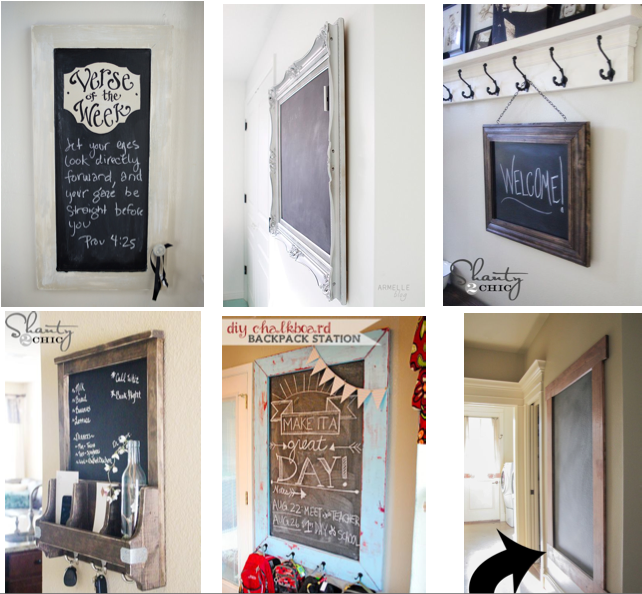 But while browsing supplies at Hobby Lobby I saw a plain framed chalkboard that cost about $5 after a 40% discount — less than what a can of paint and a wood board would have been — so I bought it. My husband cut it to fit the frame then tacked it in with small nails. I switched the wire on the back to hang it vertically and a piece of chalk lays on top in a shallow divot in the frame. Ta da! Project finished! 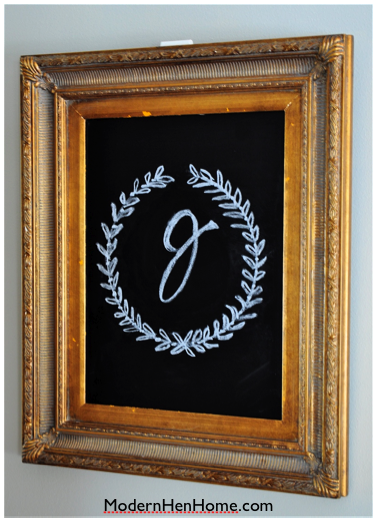 The old frame is working out great as my fun, new chalkboard and was much easier to make than I thought it would be. Move over boxed pudding there’s a new gal in town. This southern belle is a cookie lover’s dream. …crunchy wafers and banana slices in between. 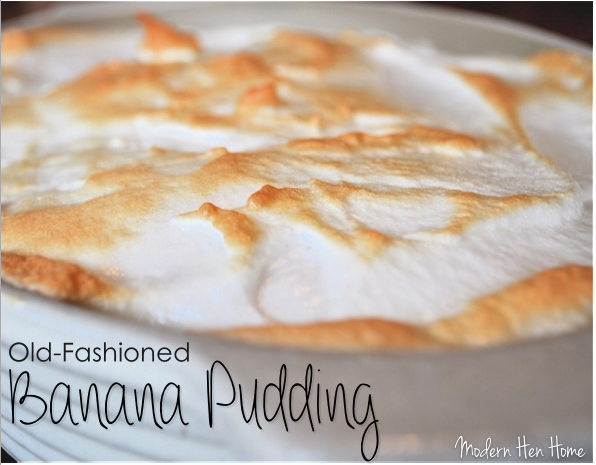 It’s the best banana pudding ever! 2. Whisk together milk and next 4 ingredients in a heavy saucepan. Cook over medium-low heat, whisking constantly, 15 minutes or until pudding-like thickness. Remove from heat and stir in vanilla. Pour over vanilla wafers and bananas in dish. 3. 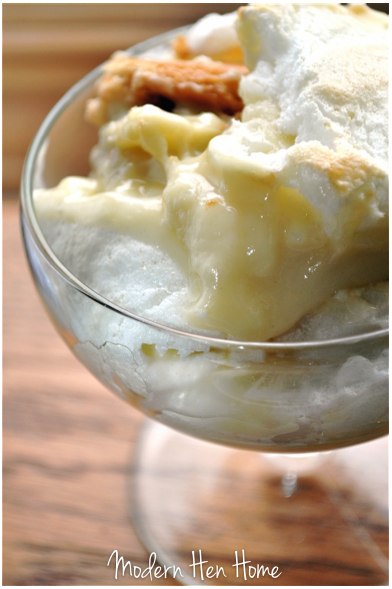 Prepare Meringue: Beat egg whites at medium speed with an electric mixer until foamy. Gradually add sugar, beating until stiff peaks form. Spread meringue over pudding, sealing edges of bowl. Bake at 325* for 15 minutes or until golden. 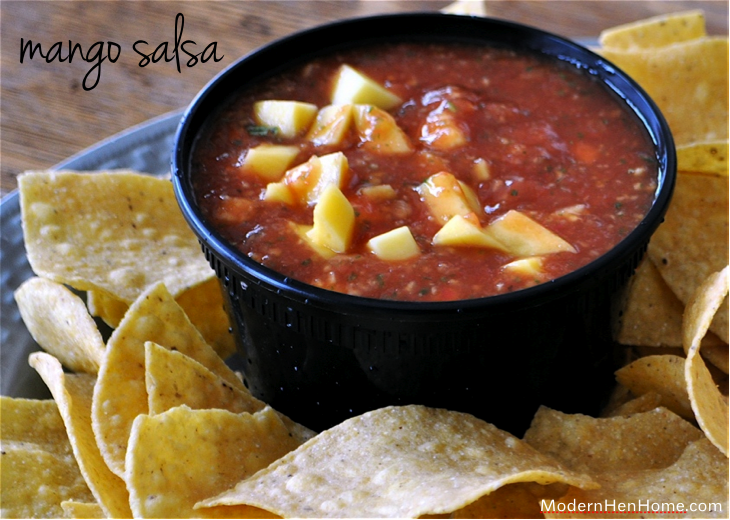 Serve immediately, or let cool completely (about 30 minutes), and cover and chill 1 hour. I like to eat salad often but find lettuce with dressing a bit boring after a while. So whipping together a variety of seasonal vegetables with legumes or small pasta and herbs keeps things much more interesting. 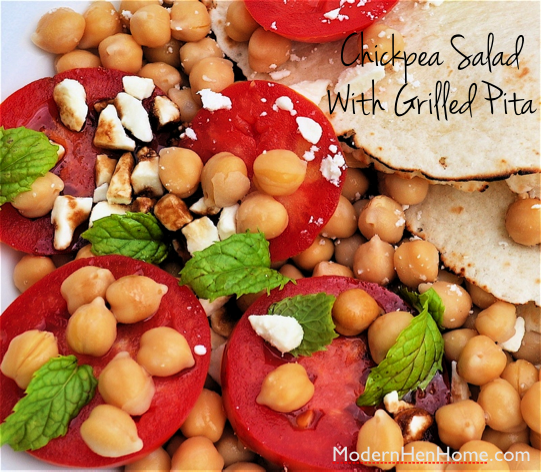 This summer tomatoes and chickpeas salad with rich balsamic dressing and mint leaves tossed in is so good. Feta adds a touch of salty creaminess, and toasted pita or tortilla keeps it hardy and is great for soaking up the delicious juices. 1. In large serving bowl combine beans, tomatoes, feta and mint. In small jar or dish combine vinegar, oil, 1 tbsp sugar, and 1/2 tsp black pepper; whisk to combine. Pour over salad and set aside.